Highlights of Rova founding member Jon Raskin’s early career include his ’70s participation in new music ensembles directed by John Adams (San Francisco Conservatory of Music) and Dr. Barney Childs (University of Redlands). Before Rova, Raskin served as music director of the Tumbleweed Dance Company (1974-77), was a founding member of the Blue Dolphin Alternative Music Space and participated in the creation of the Farm- an art project that included a city farm, a community garden, Ecology Center, Dance and Theater companies and organized the creation of a city park. Highlights as a member of Rova include composing a collaborative work for SF Taiko Dojo/Rova, working with Howard Martin on the installation work Occupancy, composing music for Mr. Bungle/ Rova, organizing the 30 year Anniversary Concert of John Coltrane’s Ascension, performing the music of Miles Davis at the Fillmore with Yo Miles! Raskin has received numerous grants and commissions to work on a variety of creative projects: NEA composer grant for Poison Hotel, a theater production by Soon 3 (1988); Reader’s Digest/Meet the Composer (1992 & 2000); Berkeley Symphony commission (1995). Raskin’s recording experience include Anthony Braxton, Eight (+3) Tristano Compositions 1989 For Warne Marsh (1989) and The Bass & the Bird Pond with Tim Berne (1996), Wavelength Infinity- A Sun Ra Tribute, Between Spaces with Phillip Gelb, Dana Reason & Pauline Oliveras, Terry Riley’sIn C 25th Anniversary, and solo work on the Artship series. 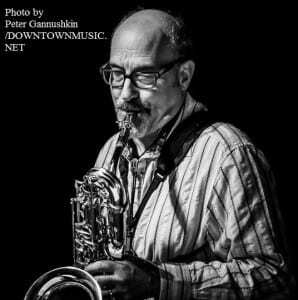 He also performs with the Phillip Greenlief and Phillip Gelb in the Wind Trio of Alphaville and in a trio with George Cresmaschi and Ches Smith. Rova Saxophone Quartet , the acclaimed all-saxophone ensemble, has fundamentally extended the horizons of music since forming in 1977. Positioning themselves at music’s most dynamic nexus, Rova has become an important leader in the movement of genre-bending music that has its roots in post-bop free jazz, avant-rock, and 20th century new music as well as traditional and popular styles of Africa, Asia, Europe and the United States. With its potent mix of stellar musicianship and compositional creativity, Rova explores the synthesis of composition and collective improvisation. The result is adventurous works that are ardent and riveting, exhilarating and free-spirited. While much of Rova’s music is composed by its members, the group has also collaborated with and commissioned new works by a wide range of creative artists. Since its founding, Rova has released over two dozen recordings of original music.